Zeroing in on a venue, finalising the wedding dress, endless hours of shopping, handling logistics and managing umpteen guests and their demands were just the beginning. After months of planning, here you are on the dais with your better half with all the madness over. It is now time to leave behind all other commitments and celebrate each other’s company, togetherness and love. It’s honeymoon time and it’s just for the both of you. Synonymous with honeymooners, Mauritius – the Paradise Island, is the ultimate tropical beauty. With the endless stretch of tranquil blue ocean, Mauritius presents unparalleled time in the water with adventure sports like skydiving apart from trendy bars, clubs and restaurants. You and your love can also get pampered at the therapeutic spas. Honeymoon in Mauritius is incomplete without a walk in the finest beaches like Grand Bay, Pereybere, Belle Mare, and Blue Bay. You can also hire a car and enjoy a long drive along the widespread coastal roads. May to December: Onset of winter is from May and it is the best time to enjoy walks on the beaches and nearby islands. Wildlife and water-sports enthusiasts too can have a great time. January to April: January is the beginning of summer and it is a time to discover the beaches minus the tourist crowd. This time guarantees good deals on hotel stays as well. The Maldives is perhaps the most romantic Indian Ocean archipelago that greets honeymooners with perfectly-planted, palm-tree covered islands, white sand beaches, crystal-clear turquoise water and arrays of luxury resorts. Don’t miss the alluring underwater sea life during day-time diving and night-time snorkel tour with beautiful corals around and giant whale sharks. Year-Round Destination: Though it is never a bad time to visit the Maldives, the best time is December to April. The weather is at its best during this time with warm temperatures with almost nil rain. A trip at any other time is not bad either. Shortlisting Italy as a honeymoon destination can never go wrong. Italy is the home of romance. The gondolas of Venice, stone villas and cobblestone paths of Tuscany and the nightlife of Milan makes it the perfect place to start. Don’t miss the opportunity for a wine tour and the castles of Piemonte and Tuscany to discover the true essence of Italy. Connoisseurs can indulge in the haute cuisine of Lombardy. April – June and Mid-September – October: During this time, Italy has the apt temperature, rural colours are at its best and there is not much crowd, thus giving ample privacy to the couple. The city is a perfect blend of romance, fashion, architecture, food and culture. The city of lights offers majestic gardens and glorious palaces. A snuggle on top of the Eiffel Tower or a kiss under the Pont Marie bridge will make it a memory to cherish. Indulge in the best fashion brands and a range of perfumes that no other city can offer. June – August: The weather is perfect for some romantic strolls at this time. Fall and spring are also quite pleasant. September to November and March to May is good for those who are budget-conscious. One of the top choices for honeymooners in Asia remains Bali. The breath-taking view of the island is the perfect beginning to a beautiful relationship. Bali will definitely stir up your passion at the secluded beaches. You can explore the Isle of the Gods cycling through the villages fringed by greenery and volcanic mountains. Untouched forests and exotic white sand beaches add to the allure of Bali. April – June and September: Even though this is not the busiest period of the year, there are many reasons to plan a trip just before and after the high season. It is still dry with little less humidity. You can avail rooms and villas cheaper than usual. There are sales and promotions across many shops. July – August: This period remains prime-time and the busiest ever. 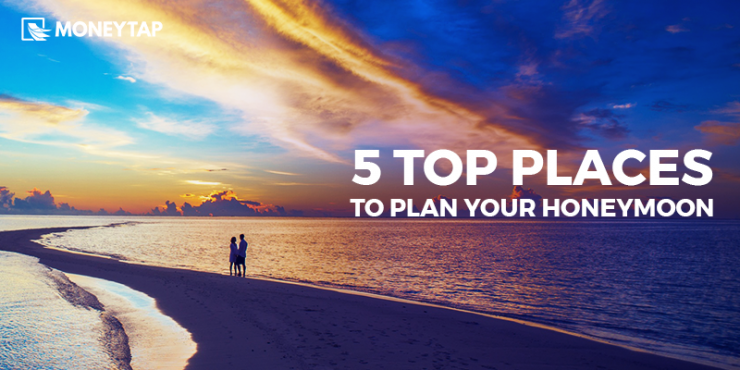 Plan your honeymoon according to you and your partner’s needs. Don’t let anything, especially your bank balance, ruin it. After planning for your dream wedding expenses, if you think an international honeymoon is stretching your limits, try MoneyTap’s personal line of credit for your honeymoon financing and let the after-wedding celebrations continue into your perfectly-planned-for honeymoon.